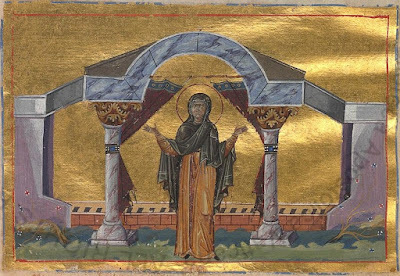 Mariamne sees Christ of Mary the Virgin. After the Ascension of our Lord Jesus Christ, the Holy Apostle Philip went with the Holy Apostle Bartholomew and his sister Mariamne to Hierapolis in Phrygia. Along the way they met Saint John the Theologian in Lydia. In Hierapolis the inhabitants worshiped vipers and serpents, in particular one large viper which was killed through the prayers of John, Philip and Mariamne. After this Saint John went on his way, while Philip, Bartholomew and Mariamne diligently worked to vanquish the gloom of idolatry from Hierapolis. Many were baptized, and a bishop and presbyters were ordained. The sick and the demonized were also healed through the grace possessed by the Saints. Having healed the blind man Stachys, he allowed them to stay in his home. 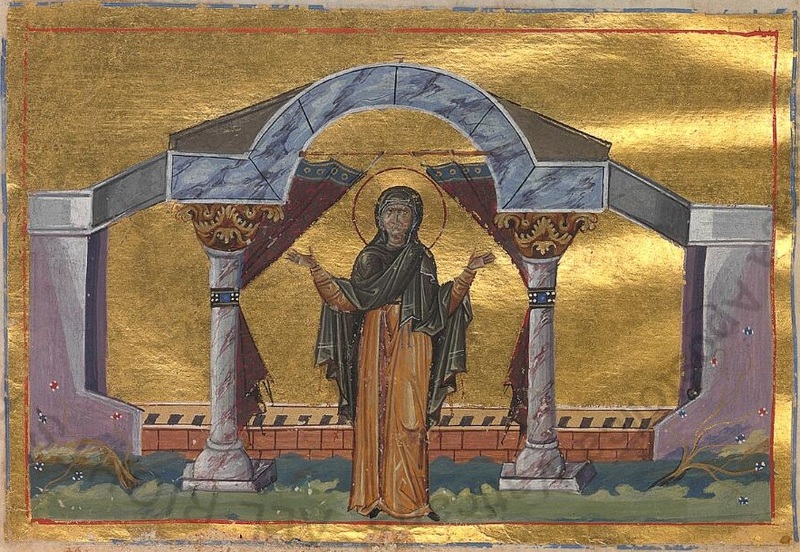 One day the wife of Governor Nikandor of Hierapolis was bitten by a snake and was near death. By the word of Saint Philip alone she was healed. After the wife of the governor came to believe in Christ, the governor was displeased with his wife's conversion. He therefore arrested the Saints and burned down the house of Stachys. The Saints were then dragged through the city streets, beaten and mocked, and finally imprisoned. After they were condemned for both slaying the viper which they worshiped and for converting the inhabitants of Hierapolis to Christianity. The governor thought the Saints may be magicians, and because of this they were able to work various wonders. He therefore had them stripped and searched for magical charms, but found nothing. 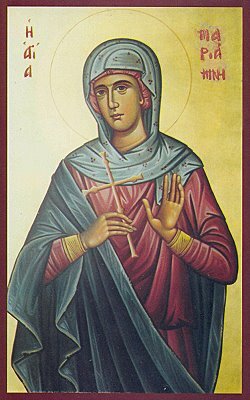 However, when the virgin Mariamne was stripped, she was covered by a divine fiery flame. The three Saints were then condemned to be crucified. After they crucified Philip and Bartholomew upside down to the wall of the temple, suddenly a great earthquake struck, and the earth opened up and swallowed the governor together with many impious pagans. After the people begged the Apostles to spare their lives, the earthquake ceased. The Christians then rushed to take down the Apostles, and managed to rescue Bartholomew, but for Philip it was too late. 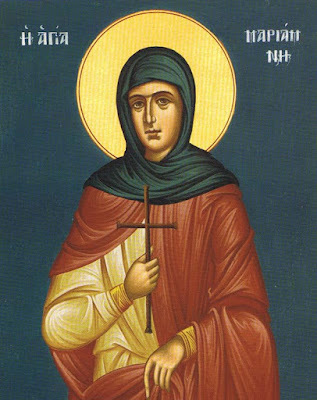 Mariamne then had her brother buried in Hierapolis. Meanwhile Bartholomew baptized the rest of the inhabitants, and appointed Stachys as their Bishop. 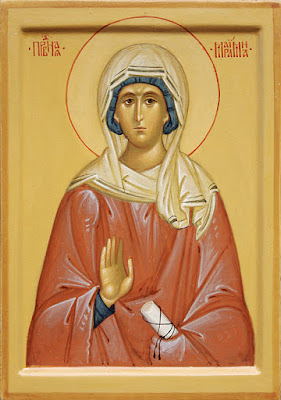 Bartholomew then departed for Armenia, where he died by crucifixion, and Mariamne went to Lykaionia where, after converting many to Christ, she reposed in peace. As a lamb you followed Christ the Savior, a blameless lamb together with the renowned apostle, her brother Philip, all-revered Mariamne, you astonished all, and you became for many, a benefactor of souls, proclaiming heavenly life. 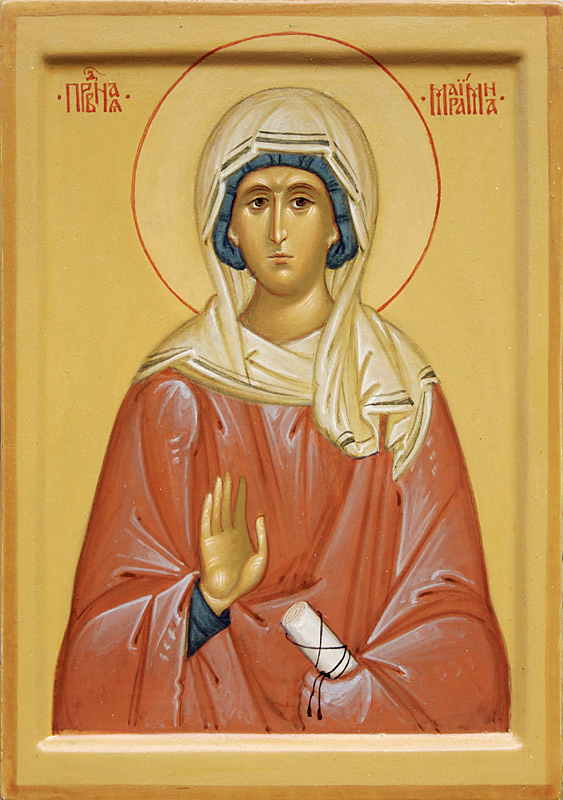 You banished away delusion from us, divine Mariamne, and consecrated to Christ, our longing for Light, we celebrate your memory, and with longing venerate, your revered icon.